This structure is not too large or extravagant, however, the villiagers are more than happy to have this shrine to pay their respects through. This temple's construction was funded largely by the people of the city itself. It isn't too large, but it has a handful of rooms to house idols of various dieties, and please them too. 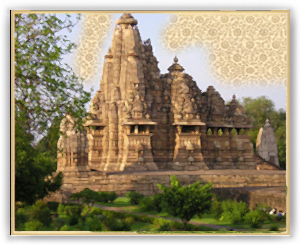 This temple is a beautiful structure devoted to a large number of gods. All those who walk past this structure stare at it in awe, and the Raja knows that the gods are blessing him for having made this house for them. This elaborately decorated temple seems to be THE house of gods. There are hundreds of chambres for many gods, and the brahmins are pleased beyond measure. If size is an indication of devotion to gods, then the people of this city are not only rich, but love the god as much as they love their spouses or children. Intricate carvings, elaborate decorations and hundreds of idols made of expensive and rare materials, some brought from abroad. The brahmins had asked the Raja to make a more respectable house for the gods, and this is as respectable a house as any. The brahmins are pleased with this city, and its people. The Rana and Raja have been notified that the gods are also pleased, and that their blessings will show themselves soon enough.